like a lone cricket, perfected in its measure. and not to let it go. through a mountain in western Maryland. farther away, now, you are sure, than this. Claudia Emerson’s books, Pharaoh, Pharaoh, Pinion, An Elegy, Late Wife, Figure Studies, and Secure the Shadow were published as part of LSU’s Southern Messenger Poets series. Her forthcoming collection, The Opposite House, will also be part of the series. Late Wife won the 2006 Pulitzer Prize for poetry. Emerson’s awards include fellowships from the National Endowment for the Arts, the Virginia Commission for the Arts, a Witter Bynner fellow and a Guggenheim Fellowship. She teaches in the MFA program at Virginia Commonwealth University. is necessary and not enough. over the Pont Des Arts. be the body of the one I loved? The weather fits my errand. across the famous Paris cobbles. in a place and its actual shine. are here now, in your life. Rachel Jamison Webster is author of the full-length collection of poetry, September (Northwestern University Press 2013) and a recipient of awards from the Poetry Foundation and the Academy of American Poets. She teaches poetry and literature at Northwestern University and edits the online anthology of international poetry, UniVerse of Poetry. Of its blossoms, a heaviness cascading like love or grief. To grasp and gladden, gorge on brevity. Joan Colby publishes in Poetry, North American Review, Gargoyle, etc. Her most recent books are Selected Poems, Properties of Matter and Bittersweet. A recipient of an Illinois Arts Council Literary Fellowship and two Literary Awards, she is a winner of the Atlanta Review International Poetry Contest. dismayed the road did not continue. their cubbyholes lined with shoes. What can you learn in ten weeks? Heat is one measurable thing. the heart. For instance, faith. not had a winning record in eighteen years. I asked. What are you looking for? Did they think I lied? or not. Mascara, or not. in that heat, that vast rainless scape. into everything, no mixing, blending. It just is, a fact. and rages orange-red in fall. they wanted, and I could translate the way. the soccer field, the ice rink closed for the season. the novelty act, on the lowest level. I said again, and I will lead you there. They in their uniforms, and me in mine. they wave flags and fists back. It is easy to scoff, yet I scoff. who did not accept their late work. Who failed them for plagiarism. Jim Daniels’ fourteenth book of poems, Birth Marks, was published by BOA Editions in 2013. His fifth book of short fiction, Eight Mile High, was published by Michigan State University Press in 2014. A native of Detroit, Daniels is the Thomas Stockham University Professor of English at Carnegie Mellon University. My hands reached and grabbed. my liver shows itself to the probing beak. his absorption feels like love. Alison Stone wrote Dangerous Enough (Presa Press 2014), Borrowed Logic (Dancing Girl Press 2014), From the Fool to the World (Parallel Press 2012) and They Sing at Midnight, which won the 2003 Many Mountains Moving Award. She was awarded Poetry’s Frederick Bock Prize and New York Quarterly’s Madeline Sadin award. She created The Stone Tarot and is a licensed psychotherapist. the treeline blinding even with my eyes shut. to the crook of the Blue Ridge, the Vale of the Cross. rhododendron ribs above, our Carolina pagoda. across hell’s high waters, in and out of time? Linda Parsons Marion is an editor at the University of Tennessee and the author of three poetry collections. Marion’s work has appeared in journals such as The Georgia Review, Iowa Review, Southern Poetry Review, Asheville Poetry Review, Shenandoah, Birmingham Poetry Review, in Ted Kooser’s syndicated column American Life in Poetry, and in numerous anthologies, including Listen Here: Women Writing in Appalachia. and breaking down the sun. Hélène Cardona is author of Dreaming My Animal Selves (Pinnacle Book Award) and The Astonished Universe. She holds an MA in American Literature (Sorbonne), taught at Hamilton College & Loyola Marymount University, translated Dorianne Laux and Gabriel Arnou-Laujeac, and received fellowships from the Goethe-Institut & Universidad Internacional de Andalucía. She is Chief Executive Editor of Dublin Poetry Review and Levure Littéraire. paint our necks in their ice breath. The speed down there, strange brass we almost hear. turning in the next room. None of it’s a dream. our sinuous heat. We want our children safe. we throw our glass wombs. While Sisters fill, no answer. our bodies from the rain. means to chafe the moon’s lit throat. their skin so mild and lonely? crowned in our own shards. Sally Rosen Kindred is the author of two poetry books from Mayapple Press, No Eden (2011) and Book of Asters (2014). She has received fellowships from the Maryland State Arts Council and the Virginia Center for Creative Arts. She was not a martyr or a quiet saint standing in the shadows. She did not wear long pastoral dresses or hang laundry in the breeze like a slow ballad. She was not the woman with the quake of trauma in her eyes or a sadness that filled out her body, did not know loss or grief or anything that would make her life more literary in its descent. And he did not hum to Willie Nelson on anonymous country nights with a six pack of American bud. He did not own a rifle or come home with sawdust on his clothes or a tattoo of Jesus on his back, knew nothing of deer season or the sound of Chevy trucks stuttering blindly through dirt lots. And they never taught me the names of wild flowers or the taste of pig belly, the hereditary maze of logging roads. I did not weave baskets out of corn husks or tabulate the sorrow of crows in dusty fields. And she did not soak toast in milk and serve it in a white bowl or remember the time of day her first child was born. And he did not believe in aspirin or war or capital punishment, never raised his voice to god or to his dead mother, never questioned the physics of the afterlife. But he knew how to swim the length of the shore without being swallowed by birds. And she knew how to tilt her body through bay windows without breaking the glass, knew how to light a cigarette from the bottom of a toaster on Sunday mornings. And I knew just enough to know what it might be like to kill for love, knew the Spanish names of ocean storms, its yearly parade of dark bones stumbling through early September. I knew the dangers of clouds, the grey hiccups of sky surrounding the moon, the cave of its strange silence startled into light. And I knew how love lived, how it pushed and pulled, how it breathed in the shape-shifting black holes of their eyes, in the violence of water, one terrible wave surging into the next, crashing like the bodies of lovers tearing at each other, all teeth and scar tissue, nerve fiber and flesh, plummeting head-first into the white soft-spoken shore, as if wanting so desperately to break the earth and everything on it open. 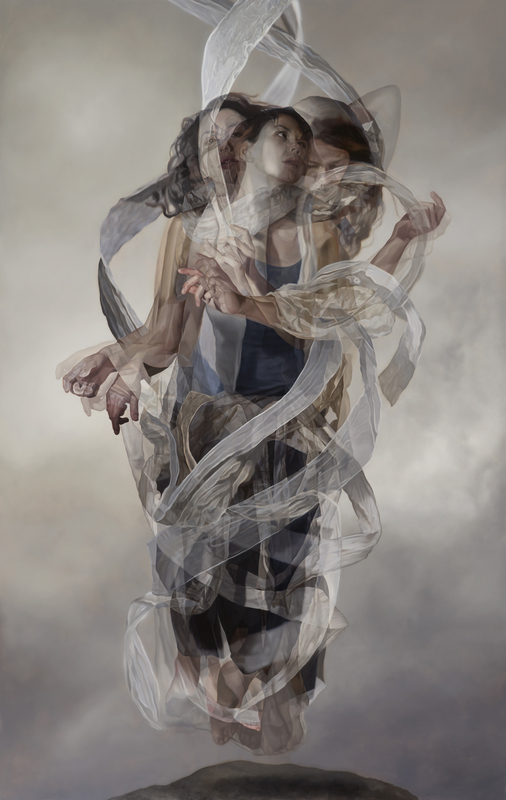 Kelly Michels grew up in Virginia Beach, VA. She received her MFA from North Carolina State University. Her poems have appeared in Best New Poets 2012, Ruminate, Blue Fifth Review, Nimrod, Redivider, Reed Magazine, What Matters, among others. Her chapbook, Mother and Child with Flowers was published in 2013.
mural, the world’s glass floor. attracted the same palette as sea views. Each pleat’s a ridge, each furrow an abyss. Mary Moore’s poems appear or are forthcoming in Unsplendid, Cider Press Review, Nimrod, Drunken Boat, Birmingham Poetry Review, Levure Littéraire, Sow’s Ear Review, 10 x 3, Connotations Press, Evolutionary Review, Cavalier Literary Couture, American Poetry Journal, Prairie Schooner , Poetry and Field. Cleveland State published The Book of Snow (1997). —and by clovers I mean lovers. in so many directions. So we quiet. I always hope someone will notice. Kelli Russell Agodon is the author of Hourglass Museum, Letters from the Emily Dickinson Room, Small Knots, and Geography. She coedited the anthology Fire On Her Tongue and wrote The Daily Poet: Day-By-Day Prompts For Your Writing Practice with Martha Silano. She is cofounder of Two Sylvias Press. exist, grip our paddles, stroke. Grace Mattern has worked for over three decades in the movement to end violence against women. Poems have appeared in The Sun, Prairie Schooner, Hanging Loose, Yankee and elsewhere. She has received fellowships from the NH State Arts Council and Vermont Studio Center and has published two books of poetry. under the moon, looking up. or acoustic guitar, peeling aubergine. on the old steel-hinged wooden traps. as before. We got away. We found out just in time how to dismantle anything. We had the tiny hand-held tools. Kathleen Kirk is the author of five poetry chapbooks, most recently, Interior Sculpture: poems in the voice of Camille Claudel (Dancing Girl Press, 2014). Her work appears in many print and online journals, including blossombones, Eclectica, Heron Tree, and Poetry East. She is the poetry editor for Escape Into Life. sputtering the crowd of leaves, broke trees, kicked hooves. Air popped, the evening seemed to surge and everything stopped. So I learned, when anger passed, the thrill of silence. on gobs of ice. Clocks finished ticking their blue minutes. Come back, I say, when sound waves in a billowing cape. Unstill the air. Come, Derecho, lay bare this stadium we’ve filled with noise. Or perhaps I need no hooves, no zap or fizz. I will go where the house is planted, down to its roots and wires. and switch by switch say no. Laura Shovan is poetry editor for Little Patuxent Review. Her chapbook, Mountain, Log, Salt and Stone, won the inaugural Harriss Poetry Prize. A Rita Dove Poetry Award finalist, Laura conducts school poetry residencies for the Maryland State Arts Council. Her children’s novel-in-verse will be published by Wendy Lamb Books in 2016.
where you have to look quick to locate the moon. the lone buzzard wheeling and waiting. Noel Crook’s first book, Salt Moon, was winner of the 2013 Crab Orchard Review First Book Award and is forthcoming from Southern Illinois University Press in early 2015. Her poems have appeared in The Atlanta Review, Shenandoah, New Letters, Smartish Pace and other journals. Not so he can fix his kid’s teeth. To survive his fiery fourth turn wreck. To finish his tan and roll their stones away. Tim Peeler is an educator from Hickory, North Carolina. He is the author of twelve books, the latest of which is Rough Beast from Future Cycle Press. beneath this rock of flesh so sharp the horizon slices open i grow two icy hearts for the torn pleasure that promises attack hidden lotus flower mango scented fingers lick and receive this night flowering appendage of would be flesh left over dreams of war fossilized childhood white prayer worms nibble stretch my dusty hips into a path winding through starless valleys old women gather in a kitchen pray for rain one less lynching one less daughter breeding in the weeds of acres their hands cannot claim acres that name their bones another winter in this land of cain where scars are bright rules whip across your back where galvanized tin mirrors flatter the bruises like the dishonest soul’s smirking tearing at it’s own likeness forgive us for we do not know how to kneel the wind speaks that too is prayer my grandmother stands with old women on a porch stained by shackled innocence she works through the night building coffins listening to the hymns of tiny devils she wolves dance beyond the dark hair wet alive merges with the wood her fur-winged lover chants a wrenching wounded hosanna sings praises to a legless moon whore becomes forbidden night shapes feasts on scissor-handed scorpions steals the lovely song of kindness from a merciful divinity. Jaki Shelton Green: poet, creativity coach, teacher, cultural activist. Her books include Feeding the Light, Dead on Arrival, Dead on Arrival and New Poems, Conjure Blues, singing a tree into dance, breath of the song. The recipient of many awards, she was recently inducted into the North Carolina Literary Hall of Fame. She lives in Mebane, North Carolina. Shadab Zeest Hashmi is a recipient of the San Diego Book Award and the Nazim Hikmet Poetry Prize. Her poems have appeared in Prairie Schooner, Poetry International, The Cortland Review, Vallum, Atlanta Review, Journal of Postcolonial Writings, The Adirondack Review and other publications. She is a columnist for 3 Quarks Daily. Whoever has not licked money will not know the intimacy of coins. Whoever has not laid seeds into the earth will have blank fingernails. Whoever has not put on her second skin will leave it in her closet. Whoever had not danced the rhumba will not slick a wet curl to her cheek. Whoever has not spread her thighs will not love that small creek. Whoever is rushing down the street will not notice the dark red plum leaf falling. Lola Haskins‘ most recent book is The Grace to Leave (Anhinga). Among her awards are two Florida book awards, the Iowa Poetry Prize, two NEAs, and recognition for her environmental writing from Florida’s Eden. Ms. Haskins teaches for the Rainier Writers Workshop. Michael McFee is the author or editor of 14 books, most recently That Was Oasis (Carnegie Mellon University Press, 2012), a full-length poetry collection; The Smallest Talk (Bull City Press, 2007), a chapbook of one-line poems; and The Napkin Manuscripts: Selected Essays and an Interview (University of Tennessee Press, 2006). nothing doing, humming above the stunned yard. Michael Chitwood has published seven books of poetry, two of which won North Carolina’s Roanoke-Chowan Prize, and two collections of prose that include radio essays written for NPR affiliate WUNC. His work has appeared in The Atlantic Monthly, The New Republic, Threepenny Review, Poetry, The Southern Review, TriQuarterly and numerous other national journals.